Set of whisky decanter and 6 glasses from the 'Aspen' collection, by Nachtmann. Opulent in shape, this set brings the brilliance of high-quality crystal glass to its full advantage. The weight, finish and design of this handmade decanter simply exude quality and style which, presented as it is in a beautiful giftbox, makes it the finest of gifts. Uisge Whisky pipette. This whisky pipette allows you to measure precisely the amount of water to add to your whisky, in order to have the perfect tasting experience! 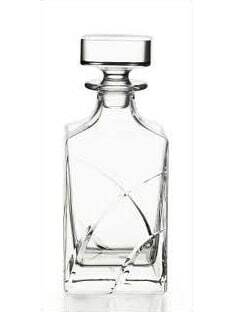 Cristal Whisky decanter by Atlantis Crystal. Malt whisky decanter. A pretty way to serve your Single Malt whisky and other spirits, this classic and elegant decanter will be the centerpiece of your next great evening. Lead-free crystal made in Europe. Quadro whisky decanter by Bohemia. Made in crystal glass, with a great transparency.